24 7 Emergency Appliance Repair - Urgent Service - Immediate Response to fix your boken refrigerator cooler, ice-maker, wine-cooler, beer-cooler, ice-machine, freezer, chiller etc. Compressor Repair, Defrost System Repair, Ice-Maker Repairs, Not Cold? We Can Fix it Fast for You TODAY. By submitting this form I digitally sign that I agree to the Terms of Services, and I understand that there is a $35 service/travel call fee for most appliances, and $45-55 in the evenings, weekends and holidays (waived upon repair completion). 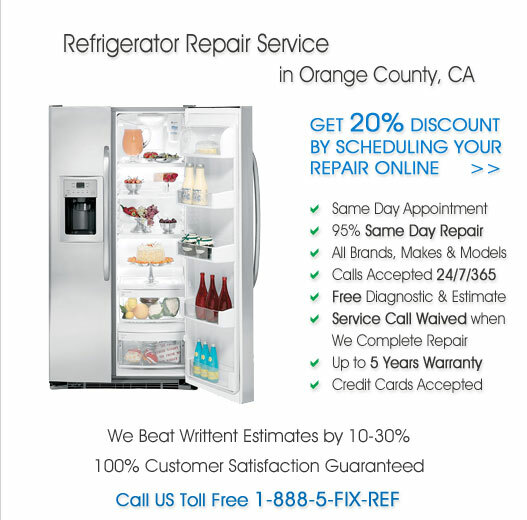 Copyright © 2010 Refrigerator-Repair-Orange-County.com. All Rights Reserved.